PanARMENIAN.Net - The Armenian government on Friday, February 8 approved its action plan which will next be submitted to the National Assembly, Panorama.am reports. The program was unveiled at a meeting on Wednesday but was not approved in order to make a final proofreading. Addressing the Cabinet of Ministers, Deputy Prime Minister Mher Grigoryan said they edited the program over the past 1.5 days to make certain amendments. 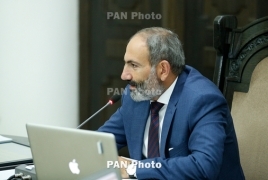 Pashinyan said the action plan received some feedback after its presentation two days earlier, with the government initiating discussions to consider them. “It helped us record once again that this government program is fully in line with our conceptual visions. A significant cornerstone of our conceptual visions is that we proclaimed the concept of an economic revolution and by this action plan we announce the launch of the economic revolution, noting that the government’s function is the same as that of the political platform of the peaceful, velvet revolution in Armenia,” he said. Under the Armenian Constitution, the parliament is set to adopt the government’s action plan within seven days by the majority of votes of the total number of lawmakers.